Using the RS-232 service tool, the AX070511, the controller is easy to setup and configure, and it has the ability to show live feedback from the unit for monitoring on a PC. No extra programming devices are required to communicate with the unit, simply a standard COM port on a PC or laptop. The controller has one programmable universal input that can be setup to read: voltage; current; frequency; PWM; or digital input signals. This input can be used to either control both outputs in a “deadband” profile, per the above applications, or alternatively, only a single output proportional to the input signal. Each of the two universal outputs that can be setup individually to drive: proportional current up to 3A, hotshot digital current; or straight on/off digital loads. The only restriction is that only one output can be on at a time. In an application where only a single output is used, it is always Output 1, with Output 2 being disabled. 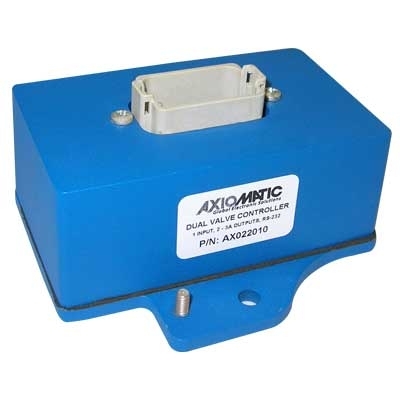 The device has a wide power supply range, and will operate from 8 to 32VDC. The supply is protected against reverse polarity connections. The unit also includes a 5V reference voltage capable of sourcing up to 10mA, which can be used to power a sensor connected to the input. The controller has a number of built-in protection features that can shut off the outputs in adverse conditions, such as a short to GND or +Vcc. These features include hardware shutoffs to protect the circuits from being damaged as well as software error react features. This unit was designed to be a simple, low cost solution to drive dual coils in hydraulic systems. Since only one output can be energized at a time, it is intended for applications in push-pull type systems such as forward-backward, lift-lower, right-left, in-out, etc. It is packaged for harsh operating environments such as mobile construction equipment. Can only be operated as ON one at a time. IP69K for high pressure, high temperature wash down applications.